Another week, another basement war. Whether it’s Zipporah Lisle-Mainwaring painting her £15m Kensington house with red and white stripes in response to neighbours’ objections to her double basement plans, or Robbie Williams and his neighbour, Lep Zeppelin’s Jimmy Page, locked in verbal fisticuffs over Robbie’s desire to dig down, expansionist plans of the subterranean kind are guaranteed to get local residents hot under the collar. Since the Royal Borough of Kensington & Chelsea tightened up on their basement rules in late 2014, other boroughs – including Wandsworth – have signalled their intention to follow suit and make it harder and costlier to get planning permission for basement digs. 3. Make sure your builders/basement company are adequately insured: One London couple recently saw their building crack in half and collapse due to basement builders who failed to support the structure correctly. The builders weren’t just incompetent – they were also insolvent, so the couple are unlikely to ever see the £300,000 in damages they were awarded. “It stands as a warning to others who reckon they can get by with the cheapest job on offer and close their eyes to due diligence,” says OLBC’s Rosie Caley. 4. Take time choosing the right people for the job: “We got six companies to come and quote. Two never came back and quotes from the other four ranged from £300,000-£400,000. One company took us around houses they had worked on and it was like meeting their fan club. Everyone was very complimentary, nothing was too much trouble, so we went with them,” says one NappyValleyNetter. 5. As prices for the work will be relatively comparable, OLBC’s Rosie Caley advises making your decision based on who you get on with best and how you want to approach the project. “Either hire an architect to draw up plans and get your consents then look for the contractor, or put the whole project from the outset into the hands of a specialist design and build company who have achieved the consents time and again,” she says. “The advantage of the latter is that we can reliably estimate the build cost before it is even drawn up, saving both time and money,” says Caley. 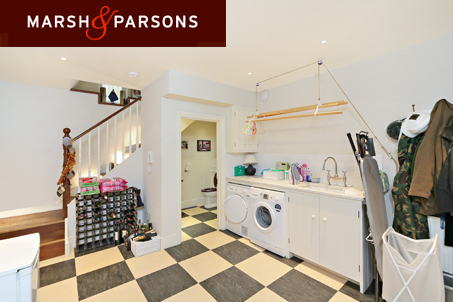 EXAMPLE FOR SALE: Four-bed end-of-terrace in Hillier Road, SW11, with large converted basement that provides a store room and additional reception or even bedroom space under the whole front section of the house. “By far the most useful conversions for a family, as they create vast amounts of additional children’s space without having to interrupt the tranquillity of the formal sitting room above,” says Jonathan Dyson from Hamptons International. £1.85m. (click here). 7. Look at the payback: Jonathan Dyson reckons a half-house basement costing £200,000 is likely to add about £300,000 to the value to your house, while a whole-house basement will cost about £350,000-400,000 and see you break even. Why? Because £1.5m is the comfort zone for family houses in Battersea, says Dyson. Above that, the numbers of potential buyers drop off dramatically. So if you add a £400,000 basement to your house, there will be a small pool of buyers prepared to pay £1.9m for a big house with the same size garden as it had before. “For £2m, they could move to Tooting and get a stonking great house with a huge garden,” says Dyson. Other people’s reluctance to endure “the upheaval of a 10-month project” is also what will make your basement a valuable asset to buyers. “You’ll certainly get your money back on your spend immediately,” adds Tamzin Incledon. 9. It’s all about seeing the light: Not every basement will add value – and those that don’t are invariably because they feel too dark and uninviting. “A basement needs to look like it’s always been there and that it belongs,” says Douglas & Gordon’s Tamzin Incledon. “Some estate agents have been less enthusiastic about the value-add to properties of creating basement space, but they have witnessed the good, bad and downright ugly over the years,” adds OLBC’s Rosie Caley, who says that a fully-fitted basement costs around £500/psf with average values across the whole area of £700-£800/psf. “Cramped ‘half footprint’ basements with poorly designed light wells could not be described as prime living space and were used mainly for utilities and storage or kids’ ‘play dens’. 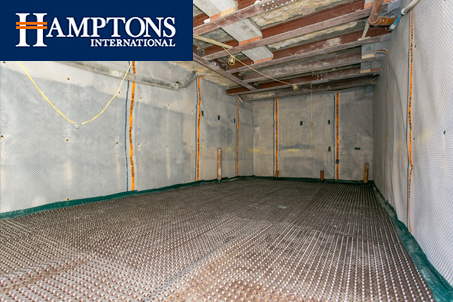 But basements have reached a new level of sophistication in terms of membrane waterproofing systems that eliminate damp and good quality design that maximises light and space.” Getting the light right is crucial. “You should have light wells at the front and back,” says Tamzin Incledon. “Connecting the light well so that it opens up onto the garden is a must,” says Marsh & Parsons’ Tom Crabtree. EXAMPLE: For an example of expertly-done basements, Jonathan Dyson at Hamptons International rates a new development of four mews-style houses with large basements on Chatham Road, SW11. There are two types of property – two six-bed houses and two five-bed houses, some with media/family/play rooms in the basement, some with media room/bedrooms and studies. They are priced at £2.95m, Hamptons International. 11. Add lots of storage: If you are developing an existing basement space, then you will be losing vital storage space. Make sure your new basement design incorporates plenty of large cupboards to keep it hidden away. EXAMPLE: A rental with plenty of basement storage: Five-bed semi-detached Victorian house on Nicosia Road with a basement that includes a guest cloakroom, large utility room and a huge amount of space for storage. Available to rent for £2,100/pw. (click here). 12 Dig deep: “Digging dirt is expensive – it’s not like building a loft – but it’s worth the extra cost to dig down that extra foot as you will get it back. The aim is to make the space feel as non-basement as possible,” says Tom Crabtree. The legal minimum for basement ceilings is 2.3m, but go for 3m to avoid a dark, dingy feeling. 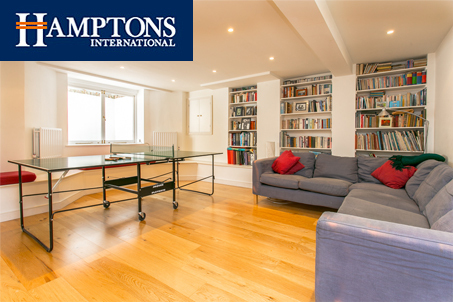 EXAMPLE FOR SALE: Six-bed house in Nicosia Road, SW18, completely refurbished by the current owners including a light, spacious basement with three-metre high ceilings in the main family room and masses of built-in storage. The basement also includes a well-equipped utility room/second kitchen, shower room, bedroom, two storage rooms and a gym (which could otherwise make an ideal media room or office). £3.75m, Rampton Baseley. (click here). 13. Don’t stint on the fit-out: “What we’ve done is great, but if we’d had double the amount to spend, it would have been amazing,” says Jonathan Dyson, who spent £180,000-£200,000 on the dig and £60,000-£70,000 (minus VAT) on the fit-out of his basement in his Mallinson Road home. 14. Set aside money for redecoration: After the work is done, the house will take some time to get used to its new dimensions – and that will invariably lead to a few (hopefully manageable) cracks. “Our front door moved, which cracked the floor tiles in the bathroom above. Our neighbour also had some cracks as a result, so we set aside £10,000 to cover repairs. Legally, you only have to redecorate your neighbour’s house once, but if you want to stay friends…” says Jonathan Dyson. EXAMPLE: Four-bed house in Mallinson Road, SW11: This Victorian house has three floors currently and planning approval for a full basement and mansard extension. £1.5m, Rampton Baselely. (click here). EXAMPLE: Two-bed flat with basement in Byrne Road, SW12: This large, elegant flat on the raised ground floor of a Victorian building – originally two townhouses converted into three large, lateral flats – also has a disused basement that is being developed. The flat also comes with planning permission to add a third bedroom and second bathroom to the ground floor. £649,000, Marsh & Parsons. (click here). EXAMPLE: Five-bed house on Altenburg Gardens with a basement ready to be customised: The owners of this modern-build house in Victorian style have dug a large (627 sq ft) front basement but, due to an overseas posting, are selling so that the next owner can fit it out to their own layout and finish. £1.795m, Hamptons International. (click here). 16. ‘If you want to do it, do it now for peace of mind: “I have no doubt that Wandsworth will eventually clamp down on basement conversions, but feel this move will be a long way off. If the homeowner is worried, then get the planning permission in place now,” advises Incledon.